AUDUSD broke above the bearish trend line on the 4-hour chart, indicating that consolidation for the downtrend from 0.7897 is underway. Range trading between 0.7624 and 0.7718 would likely be seen in a couple of days. As long as the price is below 0.7718, the downtrend could be expected to resume and further decline to 0.7500 area is still possible after the consolidation. Near term support is at 0.7624, a breakdown below this level could signal resumption of the downtrend. 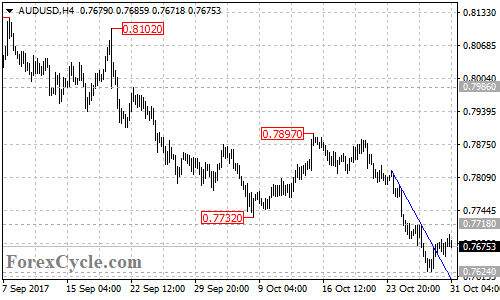 On the upside, a breakout of 0.7718 resistance will suggest that the downtrend had completed at 0.7624 already, then the following correction rebound could take price to 0.7800 zone.